Guide to the Atlas Academy Uniform in Fate Grand Order (NA). Check out here the stats, attributes, and skills of the Atlas Academy Uniform in Fate Grand Order. 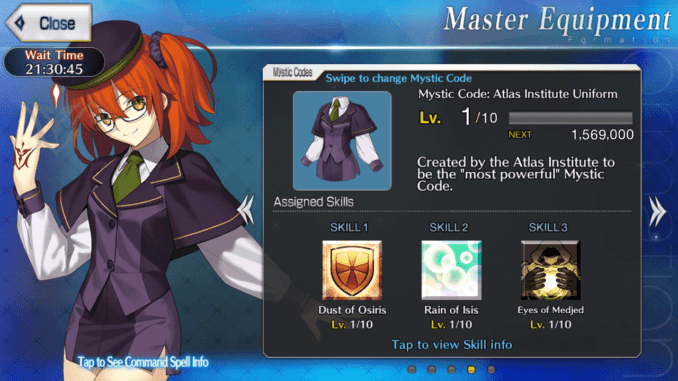 Mystic Code: Atlas Academy Uniform focuses more on sustain in comparison to the other mystic codes. Unlike the Mage’s Association Mystic Code, the Atlas Academy Uniform focuses on granting invulnerability and debuff cleansing. However, it also has a particular skill that’s similar to Tamamo no Mae’s Noble Phantasm – Eightfold Blessing of Amaterasu – which allows it to reduce the cool down of a servant’s skills. If players find themselves trying to survive an incoming onslaught from a boss such as a Demon of Goetia or a Dragon then, the Atlas Academy Uniform will definitely prove itself in combat. Grants invulnerability to a Servant for 1 turn. Similar to Mash’s Obscurant Wall of Chalk, Dust of Osiris grants invulnerability to a servant for one turn. And if paired with a team that needs some invulnerability, the Atlas Academy Uniform can cover that part for you with this skill. Particularly, you can also use the Dust of Osiris as a secondary defensive measure. For example, combining Mash’s Obscurant Wall of Chalk with Dust of Osiris can save both Mash and a servant that’s crucial to the battle. After the invulnerability ends, players can use Eyes of Medjed to drop the number of turns on the cooldown of Mash’s Obscurant Wall of Chalk. The Rain of Isis is a debuff remover which can help servants such as Jeanne D’ Arc (who suffers a stun debuff after using her Noble Phantasm) since her Interlude Quest which prevents her from receiving stun is not yet available. Another servant who can benefit from this are servants who drop their defense or any stat for the sake of gaining C. Stars such as Phantom of the Opera who drops his defense for using Innocent Monster. Reduces cooldown of all skills of a Servant by 2. This skill can be a lifesaver especially if the skill either stuns, increases the NP gauge or grants evasion to any servant or to all servants like David’s skill. However, the number of turns the skill reduces does not increase but the lower cooldown can help. Players can use this on servants who rely on invincibility and evasion to survive in combat.